Work for people to see or people to see your work? This is my first big art project and it has been a huge learning experience. For the last two years I’ve been growing plants to turn into paper and subsequently into artwork. Having harvested the crops I started serious work on planning the exhibitions in January, thinking that I had almost four months to make work and promote the shows. Now here I am, two days before the preview and I feel as if it’s been more like three and a half months planning and promoting the exhibitions and all the other things associated with an ACE project, and making the artwork has been largely squeezed into the last three weeks… while still finishing off the planning. So I ask the question again. Do you spend your time making work for a few people to see or should you do a lot of promoting, getting the advertising just right, so lots of people see work that has been hurriedly made, framed and presented? 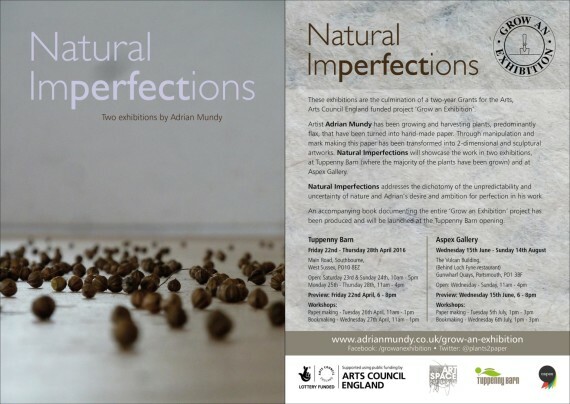 Natural Imperfections is the culmination of a two-year Grants for the Arts, Arts Council England funded project ‘Grow an Exhibition’. 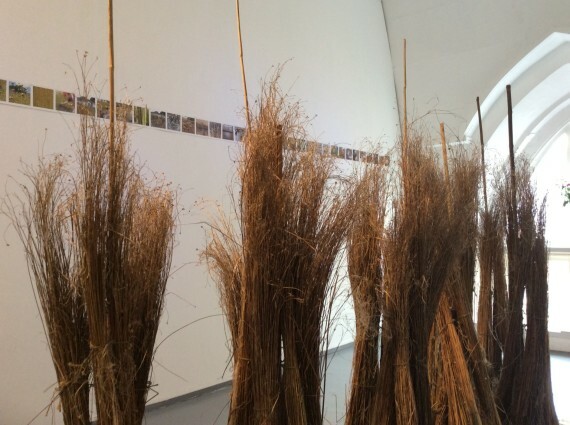 Artist Adrian Mundy has been growing and harvesting plants, predominantly flax, that have been turned into hand-made paper. Through manipulation and mark making this paper has been transformed into 2-dimensional and sculptural artworks. Natural Imperfections will showcase the work in an exhibition at Tuppenny Barn, where the majority of the plants have been grown. Natural Imperfections addresses the dichotomy of the unpredictability and uncertainty of nature and Adrian’s desire and ambition for perfection in his work. An accompanying book documenting the entire ‘Grow an Exhibition’ project has been produced and will be launched at the Tuppenny Barn opening.